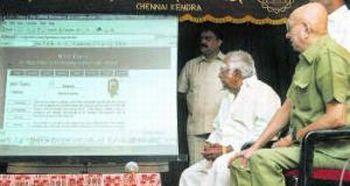 A website for composer M.S.Viswanathan was launched in Chennai recently. The assemblage that had converged at the Bharatiya Vidya Bhavan mini hall, Chennai, recently had one common factor binding them � the love for the mesmerising music of MSV. Even before the event � the launch of www.msvtimes.com (`The official website of Dr. M. S. Viswanathan - Legendary Indian Composer,' the site's tagline justifiably states) � began, the mood was upbeat with like-minded rasikas sharing their fascination for the inimitable composer, while others drank in the BGM of his Tamil film melodies playing gently in the hall. It was heartening to note youngsters like Ramkumar being an active part of it all � a clear example that real music transcends time and finds ardent followers in every generation. In fact Ramkumar is probably the youngest member of the core crew of msvtimes, which includes Sabesan, Ramki and Vaidy. The website that includes his music, fan club, forum and much more, is a Lucullan feast for MSV lovers. Admirers like Anantha had flown down from Mumbai just to be present at the event. Cho S. Ramaswamy, Editor, Thuglak, was the chief guest. And if Cho is around, can light-hearted banters be far behind? But on a serious note, he rightly dwelt on the humility of the composer nonpareil and said, "I'm yet to see a great achiever like him being so humble. To this day MSV is like a child, guileless and innocent. He knows nothing but music." "It's true," the music genius said in his candid acceptance speech. "I know nothing of politics, nor do I feel animus or jealousy. So I don't think any one will wish me ill. All I know is matter (lyric), meter (the musical kind) and melody. Over the years I've rubbed shoulders with political leaders but I've never taken sides." MSV's eyes turned moist on witnessing the affection showered on him by the fans and musicians present. It was touching to learn that MSV had insisted on invitations being extended to fellow musicians. Visweswaran, whose santoor and sitar had melodiously echoed many a Viswanathan strain in Tamil films, the multi-faceted M.S.Raju whose versatility went beyond his mandolin (whistling, yodelling, konnakhol, Raju could do them all with ease. Remember M.R.Radha's base voice in `Balae Pandya' for the `Mama Mapllae' song with Sivaji Ganesan? It was Raju's. ), guitarist Radha Vijayan, the indispensable flautist of the team, Nanjappa Reddiar, and several other musicians were a part of the warmth and camaraderie that pervaded the air that evening. The core crew honoured each of them. And heading them all was T.K.Ramamurthy. It was mutual admiration that the two composing greats have for each other. G.S.Mani thoughtfully touched upon the bowing skills of Ramamurthy. www.msvtimes.com is bound to grow rapidly, what with innumerable fans of the musician spread all over the world and all of them yearning for his melodies. Yet what is disconcerting is that a man whose music is no less than that of Naushad, S.D. Burman or composers of high calibre up north, is yet to find recognition on the national podium. Why is nothing being done about such an oversight that's almost blasphemous?